Modern structural design relies on steel for a variety of applications, ranging from reinforcements in slabs to ladders and stair systems. These complex designs can make it challenging for industry professionals to stay current with the best equipment and practices. If you have a project planned and require steel fabrication services, our Michigan-based company is here and ready to help! For more than 50 years, Sanilac Steel has delivered ideal results from the upper peninsula to the southern border. We understand how complex structural has become, and can work with you to develop a plan that accommodates all of your building needs in a timely and affordable fashion. Before you hire structural steel fabricators, it’s important to ensure that your chosen company offers the correct services for the job. Today, we’ll begin to highlight steel products commonly fabricated at our facility in Marlette. Learn about these structural designs below, and be sure to call our team to see how affordable our services can be! Steel structure design relies on a complex framework of components to create a sound frame for a variety of building applications. The “skeleton” of your building relies on vertical steel columns, consisting of large spans of rigid material to create the height of the structure. Structural steel provides a versatile base for a variety of cladding materials, ranging from concrete and bricks to large spans of architectural glass. Proper engineering can place more weight on fewer columns, allowing for large, open spaces such as stadiums, airports, and so on. It is essential to find structural steel pros to create lasting results for the framework of your building, and our team is happy to help! Beyond the vertical components in your structural steel design, horizontal I-beams will be essential for completing a dual-axis frame that resists high weight loads and shearing forces. Structural beams come in a variety of materials (aluminum, hot rolled steel, stainless steel) and multiple formats to perform across a wide range of uses. It’s important to rely on the right design for each application, especially when it comes to your columns and beams. Sanilac Steel is proud to deliver precise results, eliminating mistakes and creating a safe result that is both timely and affordable. Typically utilized to span an opening in a wall or to connect two vertical beams, lintels are relied on for load-bearing designs. This steel product can be used in coordination with masonry, timber, steel, concrete, and more. You can rely on standard steel lintels to conform to all regulations, or customize your design to include wide leafs, boxes, solid walls, and more for a structurally and aesthetically sound fit. Steel structure design often relies on steel trusses to deliver ideal support for bridges, roofs, and other spans. These trusses can provide structural support without taking up a lot of internal space, such as rafters. Our steel truss manufacturers can create the right joists and gambrels to ensure your structure is built to last. We can create truss systems for your I-beams, roof, grates, and more. 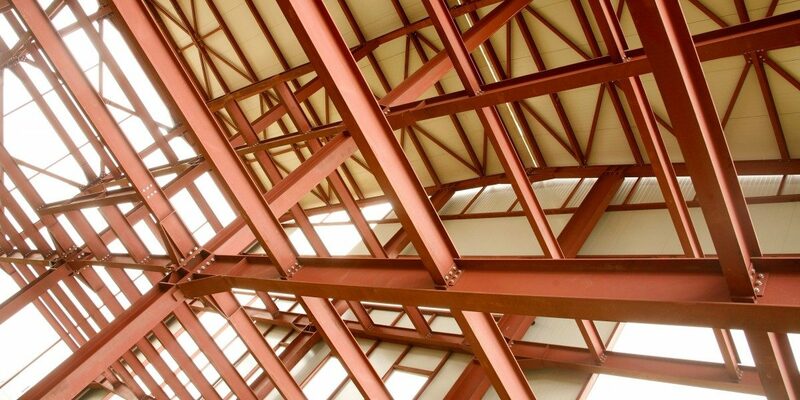 Sanilac Steel can manufacture, design, and engineer your trusses for an ideal design scheme. Contact us now to learn more! Fixed steel ladders provide ideal access points for a range of industries while complying with fire safety codes. Builders also need to plan for any local and federal regulations, including OSHA to ensure their ladder systems are safe and compliant to all standards. Sanilac Steel can also deliver ideal results for mobile work platforms, crossover bridges, and more. We have decades of experience in creating ideal outcomes across the state, and our steel fabricators are ready to assist in tailoring a precise result across many industries. Normally consisting of a steel sheet supported by a joist system, steel decks are commonly utilized in structural design to support insulating membranes, concrete systems, above-ground standing surfaces, and more. You can do much to optimize your steel deck, including changing its depths, rib spacing, final coating, material thickness, and more. We can provide you with a standardized system to best meet your needs or work with you to tailor a design that enhances your building or structure’s usability. Next time, we’ll continue this topic by highlighting a few more key components handled by our structural steel fabricators across Michigan. If you have an upcoming project and are looking for the best steel services around, Sanilac Steel is here and ready to get to work. We take pride in delivering professional results with honesty and integrity, working diligently to achieve the most efficient outcome in the safest manner possible. Our contractors have the experience and training to make a difference throughout the construction process. Contact us today to see how cost-effective our quality services are, and be sure to request a free project quote!